Man Booker Prize Short List Has Novelists New To Final Round : The Two-Way Organizers have revealed the six authors still in the British literary competition. It's the first time five of them have been in the last round. The prize is 50,000 pounds and often better sales. Six novelists have made it to the shortlist, the last step in the Man Booker Prize competition. The 2016 finalists are from Britain, the U.S. and Canada. According to the award's own website, this year's judges were "unswayed by literary celebrity" in whittling down the long list of 13 to the final six. Such popular writers as South Africa's J.M. 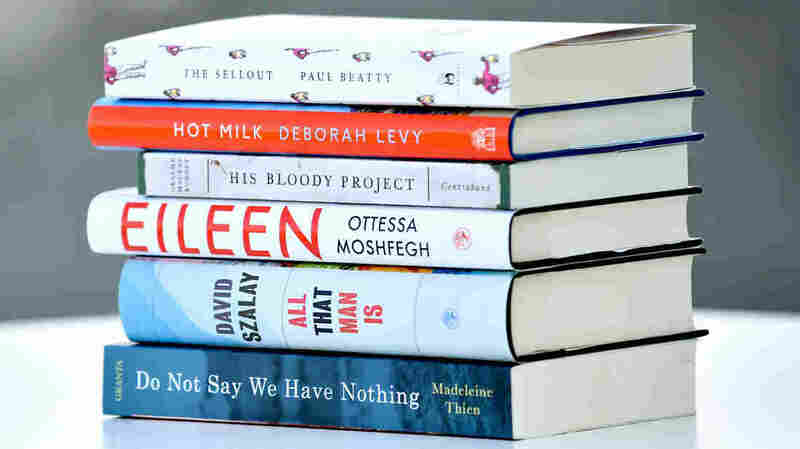 Coetzee and American Elizabeth Strout were passed over in favor of an eclectic mix of writers, including debut novelist Ottessa Moshfegh for Eileen. Deborah Levy, author of Hot Milk, is on the shortlist for the second time. The rest are newcomers to the list: Paul Beatty for The Sellout; Graeme Macrae Burnet, author of His Bloody Project; Madeleine Thien for Do Not Say We Have Nothing; and David Szalay, who wrote All That Man Is. In announcing their decision, the judges cited the writers' "willingness to play with language and form." They also noted the important role novels can have "in exploring culture and tackling unfamiliar and challenging subjects." And these novels cover a wide range of subjects: a murder trial set in 19th century Scotland, a satirical take on race relations in the United States, a family of musicians caught up in the political turmoil of modern China, and more. The winner of the 2016 Man Booker Award will be announced at a ceremony in London on Oct. 25. In addition to a prize of 50,000 pounds, the lucky writer is likely to leave that ceremony with a much higher profile and very possibly a nice boost in book sales.